Brand-new 5- bedroom villa is distinguished by its unique style, high-end quality and perfect location. 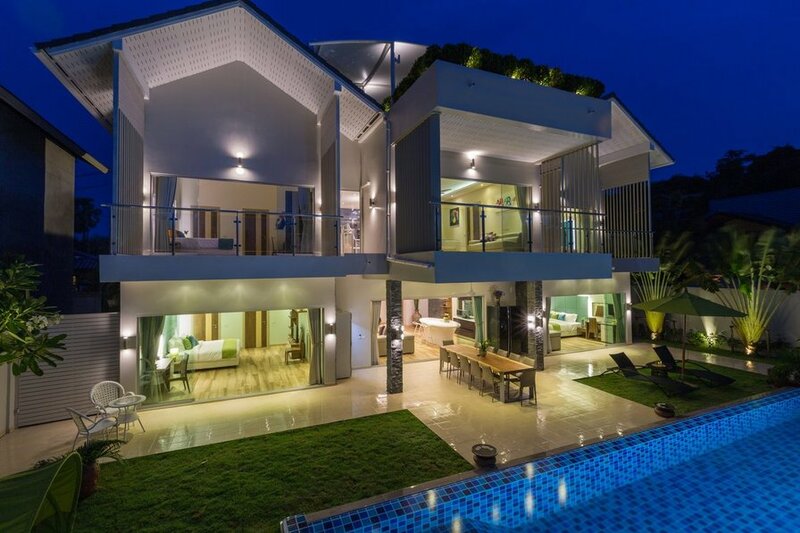 Villa is situated in a gated villa development (Ban Tai Estate) only 300 meters from paradise Ban Tai Beach. Bright color accents, modern paintings along with the attention to the finest details in the interior of this property raise your spirits and make your feel here on holiday. There is nothing dull and boring about this exceptional villa. The Asian motifs appear in decor with lots of natural stone, wood, authentic vases, nice statuettes and plenty of flowers. Amazing mountain views opening from its panoramic windows will remind you that you are on holiday in a beautiful tropical country. Villa layout provides comfortable living space for a wide variety of groups with different interests – be it families with children, elderly people or young people. Each of 5 spacious bedroom (above 20 sq.m) is equipped according to standards of a Deluxe room in a 5* hotel with stunning interior design. Every bedroom is en-suite and has king-size bed with orthopedic mattress, walk-in wardrobe, TV and private terrace (11 sq. m) with comfortable rattan furniture. For those sharing a room, a king-size bed can be easily transformed into 2 twin beds. Each room is big enough for an extra bed to accommodate a third person. Apart from private bedrooms ensuring privacy of every guest, there is enough space in the villa for a comfortable communication with friends and family. A cozy living room with a modern sofa and 48’’ TV, fully equipped kitchen with a breakfast island – it all gives you a nice feeling of “home away from home”. While on holiday, everyone wants to spend more time outside. With this in mind the dining area with a big wooden table for 12 people is located on the roofed terrace overlooking a private pool and the lawns. The border between the inside and outside areas disappears thanks to the frameless sliding doors from ceiling to floor making the villa even more spacious and comfortable. Private pool (12 meters) with comfy loungers shaded by umbrellas on the pool deck is a great alternative to the beach. There is a shallow kids zone in the pool. The whole pool is laid out in a way to protect children from an accidental fall into water. In the evening the area around the pool and the terrace can host relaxed parties with nice chill-out music sounding from outside built-in speakers. Treat yourself to a yummy seafood barbeque in a barbeque sala or just enjoy doing nothing on comfy sofas in the living room! Spacious roof-top terrace is another convenient lounge area in villa to relax and enjoy your holiday with friends. It is multifunctional and canbe used as an open-air hall for yoga sessions or just a place to laze around on soft daybeds enjoying beautiful views opening from this cozy place. One side of the terrace looks to impressive tropical mountain landscapes, while the other part faces the sea. In the night time the terrace transforms into an amazing cinema “under the stars”. Watch your movies sitting at the bar table with a cocktail or lying around on a comfortable couch. The villa is equally comfortable and convenient for any kind of people and holidays: be it students, families with children, elderly people or even disabled people. It is located on a flat ground withoutany hills, provides 2 easily accessed spacious bedrooms on the ground floor opening into the pool deck. The villa is exceptionally child friendly: shallow pool area, fenced pool (extra fence available at request), shaded lawns overlooked from any area of the villa and lots of toys. While on holidays in villa with your kids you don’t need to entertain them. We have everythingyou need for them to be entertained. At your disposal is a vast secure area of Ban Tai Estate to ride a bike or play any active games. A 5 minute stroll along the straight road surrounded by amazing landscapes will get you to a beautifulBan Tai beach club with an amazing beachfront restaurant and comfortable loungers. Everything you expect from your holiday and more offers you this villa at Ban Tai Estate.